The bright yellow flowers and ‘clock’ seedheads of dandelion (Taraxacum officinalis) make this weed easily recognisable. Dandelions are particularly troublesome in lawns but have many herbal uses and are a good early source of nectar and pollen for insects. Dandelion is a persistent, perennial weed of lawns, borders and hard surfaces. It’s difficult to eradicate dandelions by digging alone as the deep tap root can regrow and fluffy seeds are readily spread by the wind. Taraxacum is found throughout the British Isles and over 200 microspecies has been identified. Dandelions have many uses including as a diuretic, the blanched leaves can be added to salads, roots are used to make dandelion ‘coffee’ and dandelion wine is made from the flowers. Dandelion has a rosette of basal leaves sprouting from a stout tap root and exudes a milky latex when damaged. The leaves are soft, mid-to-dark green lobed or unlobed with a midrib sometimes pink especially near the base. Flowerheads are mid-yellow, 2.5-5 cm (1-2in) across; the flower stalk pinkish and hollow. The seedhead is a large conspicuous ‘clock’ composed of cylindrical seeds with a long-stalked pappus or parachute to aid dispersal. Flowers from March to October and the basal leaves persist all year. The long tap root of dandelions can regrow from a fragment if not completely removed. Plants are quick to flower and produce masses of windborne seeds. Dandelions are difficult to control by cultural methods once established. Try digging out isolated specimens, removing as much of the tap root as possible early in the spring. Dandelions can regenerate from fragments of root so it may require several attempts to completely remove a deep or awkwardly positioned plant. There are many specially designed tools to help with removal. 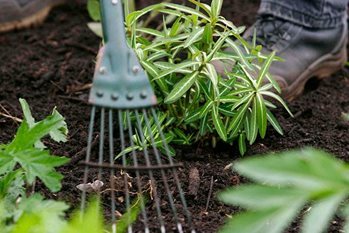 Dig plants out as soon as they appear and don’t allow to flower and set seed. Dandelions can be controlled with one or two applications of weedkillers containing 2,4-D, dicamba, clopyralid or fluroxypyr (Doff Lawn Weedkiller, Vitax LawnClear 2, Westland Resolva Lawn Weedkiller Extra and Weedol Lawn Weedkiller). Lawn weedkillers based on mecoprop-P may check the growth of dandelions but not completely kill them. Apply lawn weedkillers in summer after cutting off the flowering heads to prevent seeding, then re-spray leaves that re-grow 14 days after cutting back. Treat again in autumn if basal rosettes are present. Do not add the first lawn clippings after application to the compost heap. The first clippings from products containing clopyralid (which is especially persistent) should not be composted and the next three mowings should be used as a mulch only after composting for at least 9 months. To avoid possible contamination of compost, do not collect the clippings at all but mow frequently and allow the short clippings to remain on the surface of the lawn. These will quickly disperse to leave an acceptable finish. New lawns can be easily damaged by lawn herbicides so avoid using them within six months of seeding or turfing. However, products containing fluroxypyr (Weedol Lawn Weedkiller) are claimed to be safe if applied two months after sowing or laying turf. The new lawn must be growing well. Glyphosate is a more effective treatment for established dandelions but is not selective and any spray coming into contact with grass around the dandelions would be killed or severely checked. Use a ready-to-use spray or a gel formulation (Roundup Gel) to spot treat individual weeds. Apply when growing strongly from midsummer onwards. To control dandelions growing in cracks between paving or on other hard surfaces, use a proprietary path, patio or drive weedkiller. See our page on controlling weeds on hard surfaces.